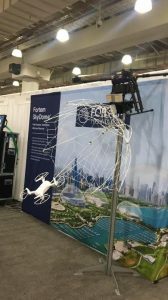 I recently attended the 2018 Unmanned Security Expo in New York City, which was held on November 14th & 15th, 2018 at the Javits Center. The expo spanned over two days, but one day was plenty of time to see every booth and even jump into some educational presentations. The types of companies in attendance were widespread, but I’ve taken a high-level approach to summarize what stood out to me the most, whether it was a physical product, software or a combination of the two. I’ll also touch on some insights I picked up on while talking with founders and/or early employees of these companies. Manage, protect & secure your airspace against unauthorized or attacking drones and other UAS with SkyDome & DroneHunter powered by TrueView radar. Fortem was showcasing their DroneHunter solution for capturing rogue drones. The solution includes their proprietary radar system called TrueView Radar. According to one of the employees I spoke with, the DroneHunter has a 96% catch rate, based on 1,200 attempts. Pretty impressive considering it takes way more bullets to shoot down a drone (skip to 12:40). However, I’m not sure this is the long-term solution for capturing unwanted drones. Does it have impressive catch rate numbers? Yes, but does it solve for the whole problem? Not in my opinion. There is a bigger picture to consider, which should include capturing the pilot that is acting in bad faith as well. There are companies currently working on this part of the problem (SkyDroner, Dedrone, ApolloShield), and we’ll continue to see more but hopefully with a holistic approach rather than just stopping one (drone) and not the other (pilot), or vice versa. All I know is that training birds to take down drones is not the solution to this problem. Yes, you read that right, birds. The Sunflower Home Awareness System™ combines outdoor sensors with an aerial camera for a complete view of what’s going on around your home. Sunflower Smart Lights™ learn your property's routines, deterring unwanted visitors with light and sound. When there's unusual activity, the Smart Lights work with the Sunflower Flying Camera™ to identify what's happening. A view of the Sunflower Home Awareness System. The charging station is uniquely designed so that the drone can land multiple ways and still get a charging connection. Move over incumbent security companies, there’s a new way of protecting your house. Drones + smart lights! 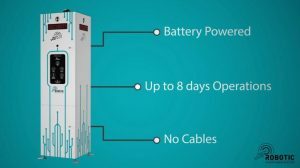 Sunflower’s system is very well designed and offers a unique alternative when it comes to protecting your home. An employee I spoke with mentioned their platform will eventually be able to connect with other sensors and video surveillance products in the market (i.e smart doorbells & window sensors), which gives customers the option to start with just the drone. Robbers, paparazzi and your teenage neighbors skinny dipping in your pool at 2am will be thinking twice when they see a drone launch into the sky and flyover to catch them in the act. This product may take some time to get to market (Beta testing in 2018) but I think it will “take off” once they launch. My guess is that the early adopters will be owners of larger estates, and then Sunflower will eventually find its way to middle-class houses in neighborhoods. I’ll be interested to see what they learn from their Beta test. Will the noise of the drone be a nuisance to your neighbors? Does it record anything beyond your property? If so, does that violate public privacy laws? How accurate are the sensors and how quick is the drone able to launch and get eyes on the activity? For anyone on the east coast or in the mountains, how does snow impact the flight and/or sensors? I’ll be keeping an eye on this one to see when it launches. The SCOT ™: Security Control and Observation Tower is a standalone remote, portable, self-sufficient security observation tower designed to expand an organization’s security reach instantly. RAD’s unique Power System allows SCOT ™ to be quickly placed virtually anywhere for short- or long-term deployments with zero investment/planning in any supporting infrastructure. SCOT ™ is available at for $ 3/hour* providing a cost-effective and easy to deploy security solution to your organization. *certain terms and conditions apply. The selling point here was the cost per hour. This is a significant cost savings for companies that currently use human security guards, as they typically run $20/$25 per hour. One of the arguments that comes to mind is whether these robots can replace every aspect of a human security guard. Why does it have to be one or the other? Why not have the robot patrol less essential/ low-risk areas and keep one main guard on post in case the tower identifies a problem? You could reduce some of your spend on security but still have effective coverage and the human touch. It will be interesting to see how this plays out as the technology used in these robots becomes more robust over the next few years and we see more in the public. 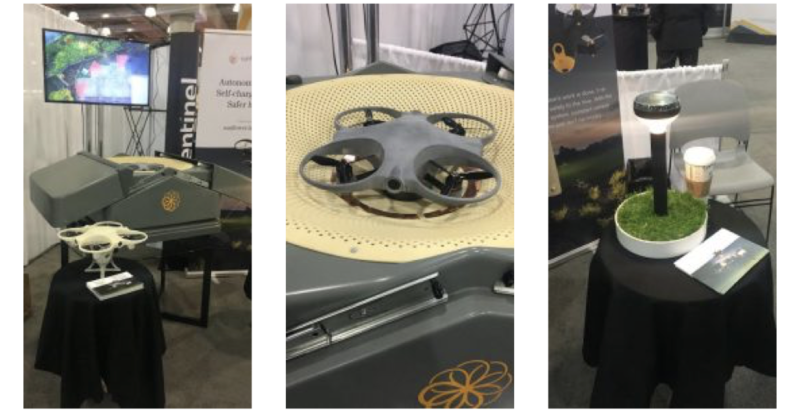 Other drone security companies at the expo included Knightscope & Cobalt. Knightscope seems to be the most well-known company in this space as they have raised $46 million and have partnered with New York’s Laguardia Airport to test their K5 Robot. Will the K5 actually deter crime? There hasn’t been much data shared on the impact the robot has had since the test started back in early 2018, however, the illegal cabbies that roam around the arrival Terminals don’t seem to be phased, per this article. Hopefully Knightscope will report their data on the test and show a positive impact, otherwise, they may be another flashy startup that raises and burns through cash to build a product that doesn’t provide enough value to the end consumer. Luminell presents the Drone lights DL Series. UAV (unmanned aerial vehicle) LED light modules designed for high light performance, also low weight and smart connect and control functions. These LED light modules are built on well-proven and high-performance technology. The specifications meet the requirements of photographers, inspection teams, Search & Rescue teams and other who need excellent LED light for drones and Unmanned Aerial Vehicles. This category was not very prevalent at the expo but this company really stood out to me. Not only for their valuable product but their ultimate vision, which is to help save lives. Based out of Norway, they have a rich history in providing premium LED lighting for maritime vessels and shipyards. After about almost a decade in business, the founders realized their expertise in lighting could be valuable in another industry, drones. That’s why a few years ago they decided to develop their DL Series lights. These lights can be a gamechanger for four main sectors of the drone industry, Search & Rescue (SAR), Inspection, Entertainment, and Security. The main sector I focused on when talking with the Founder of Luminell was Search & Rescue (SAR). 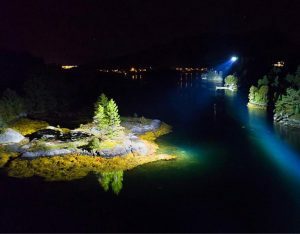 Also, consider that the drone lights don’t necessarily have to be for finding the person, it can help extend the search time by lighting up the search area for those on the ground to identify any hazardous barriers. I think it’s safe to say they are on their way to accomplishing their mission of saving lives, and that’s just scratching the surface. Looking forward to see how they expand in the US market. Suite of software products that use photogrammetry and computer vision algorithms to transform both RGB and multispectral images into 3D maps and models. The Pix4D team was showcasing their latest product, Pix4Dfields, aerial crop analysis for digital farming. The photogrammetry software essentially takes hundreds or even thousands of pictures that were taken from a drone and stitches them all together to create a seamless 3D map. 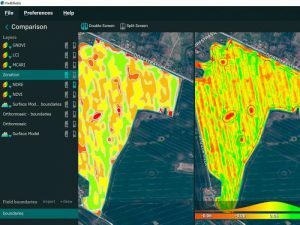 You are able to compare crop trends by overlaying different maps all at once which allows you to focus in on any trouble areas you may be experiencing with your crop output. I saw a quick demo of the software and was impressed with the processing speed. The employee uploaded roughly 100 photos into the software (simple drag & drop) and a detailed 3D map was developed in less than a minute. This product is much simpler compared to other solutions they offer but it's meant to be that way for a reason. They understand that some of their customers don’t need all the bells and whistles engineers and surveyors need in a 3D map program. They focused on a few key features and created a simple user interface so that those in the agriculture business can understand and analyze their crops faster and with ease. After talking with various companies at the expo I noticed a few similarities between them. Majority of the companies are west coast based (IMO NYC needs to change their laws to open the door for drone startups, but that’s a story for another time). The west coast offers more space to do test flights, as well as a larger pool of venture capital and talent. They are early-stage companies, 3-5 years old and have raised from a traditional VC or a strategic partnership. I see strategic partnerships as the way to go for this industry. There are a lot of veteran companies in the aviation and aerospace industries that are ripe for disruption. So why not consider investing in these drone companies and be part of the innovation. Drone companies can be very capital intensive if you are taking the hardware route (i.e Sunflower Labs & RAD), hence the reason for larger Seed rounds in this space. Also, it felt as though these companies are building in their own silos and perhaps not considering how some can work together to come up with a full stack solution to problems they are solving. For example, could Luminell be the light supplier for Sunflower Labs instead of Sunflower Labs creating their own lights for the drone and sensors? Scott Harrigan also mentions that “DJI is a great example of building partnerships with other companies such as FLIR, Ford, and Trimble. Firefighters are even actively selling DJI drones in order to create new sales channels.” If enough companies realize this I think it will push the innovation forward and the adoption of these new technologies much faster. I only needed to attend one day of this expo to realize that I’d highly recommend going to this next year. It was reasonably priced and had a wide variety of educational presentations in addition to all the booths. Everything from basic understanding of drone laws, search & rescue operations using drones and how a cybersecurity company is using their encryption software for data that is transferred between drones. If I’d have to guess, by this time next year the number of booths for this expo will double and new technology will be introduced that we haven’t even considered yet for drones.